Owning a swimming pool can be a lot of fun when it’s being used and it’s also a great addition to the appearance of a back yard well that is if it’s being kept up and well maintained. If you’re a first time pool owner it can be a bit daunting and seem like a lot of maintenance for the beginner. Here are some pointers on what to do on a weekly basis to ensure it gets the attention it needs as pools can go bad quickly if they are neglected. The first thing is to test the water chemistry on a weekly basis this can either be done by doing it yourself with a water chemistry test kit or by using test strips. You need to have an idea of how many gallons are in the pool to be able to determine what chemicals are needed to be added after the water test results are gained. You can also take a water sample to your local pool store for a chemistry test too. Read all the directions on any chemicals that are to be added prior to application. Check that all your pool equipment like pump, filter tank, plumbing, levers, pool vacuum and other items like timers are working correctly. Some pools have automation controls that need to be programed to be able to be working correctly. Also on a weekly basis the pool surfaces need to be vacuumed, brushed and skimmed and all the baskets need to be emptied of any debris that has been sucked into them. 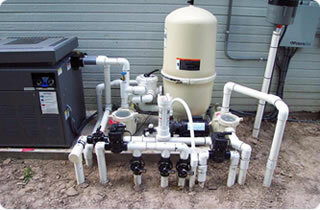 Below is a basic list of equipment you’ll need to be able to service a pool. Pool pole, pool brush, net, vacuum head, vacuum hose and the basic chemicals needed are some form of chlorination this depends on what type of pool you have. Other chemicals needed are muriatic acid, Cyanuric acid (Conditioner), PH Up, Alkalinity UP, Algaecides, Phosphate remover as well as chemical test kits. First test the water and add the needed chemicals. After that set up your equipment so that you can vacuum the pool ensuring that the majority of the suction is being directed to where you’re going to be vacuuming from which is either the vacuum port or skimmer. Ensure the filtration pump is running. After vacuuming brush the walls and the water line around the tiles and or rocks. At the end you’ll need to net the surface of the pool and empty all the baskets of debris. This is a very basic guide and there are many more things that need to be checked on a regular basis. If you need pool service assistance in the Henderson and Las vegas area contact us as we shall be happy to help with any questions that you might have using the contact us links above. This entry was tagged Henderson Pool Service, las vegas pool cleaning service, Swimming pool servicing, Swimming pool maintenance for beginners, Pool service 101. Bookmark the permalink. ← Swimming pool springtime to do list.